It’s a common enough complaint of a child of any age that his/her parent nags and tends to hover. I shared the same sentiments. But all of that came to a screeching halt – albeit temporarily – when it came to the trip with my parents to Scotland. Because with startling clarity, I realised I’d been hovering. I’d been overly worried. I’d been obscenely protective. And I stand by all of those sentiments. I didn’t want the parents to fall ill on foreign shores! This was rather evident by the number of times I asked my parents “are you okay” when we were heading back to Edinburgh after a day trip to Glasgow or the tiffs we got into over crossing the roads like merry youths. That was day 2 of the Scotland trip and all was well on almost all the fronts – except for my anxiety and stress levels. Suffice to say, I took Day 3 off to relax, find my way around Edinburgh and collect pointers for the parents’ last day in Scotland. The parents went off on their own. Day 3 was essentially, the ‘me’ time day that is much needed when you are travelling with parents. For more tips on how to make travelling with parents easier, read the previous post A guide to comfort travel for aging parents. Meanwhile, here is the schedule that my parents followed on days 3 and 4 of our Scotland trip. # The day dawned bright and clear, according to my parents. I was sleeping so I wouldn’t know. The parents had decided their chances of seeing the beauty of Scottish Highlands would be limited to a day tour so we booked them on a Highland tour bus. Our hotel arranged a cab that would take the parents from the hotel doorstep to the tour office in the wee hours. Note: There are various companies that offer Highland tours. The parents preferred a day-long trip with a small group of 16 – including them – with live commentary by the guide who ensured the parents were comfortable. And the latter was done without being condescending and hovering. # Driving up the winding roads of the Scottish Highlands was a breathtaking (breath-taking) experience for the parents. “I marvelled at the greenery around. So many shades of green together…it’s been years I saw that lush green. Wish there had been time to live in this greenery. Perhaps… some other time,” Maa shared later. The journey towards the Highlands are so beautiful, you’ll feel that you’ve landed in a parallel universe! As the tour bus takes you towards the Highlands, look out for the grand Forth Railway Bridge (a UNESCO World Heritage Site). The parents were driven around Perth and along the River Tay (the longest river in Scotland) before driving through the Cairngorms National Park. A quick stop at a roadside station for some tea and a comfort break, and the bus continued to the main stop, the Loch Ness. # Loch Ness is one of the biggest lochs of Scotland and has gained notoriety for being home to Nessie, the Loch Ness monster. Though why a monster would have a cute name like Nessie is beyond me. A quick lunch of fish and chips done, you could opt for a 30-minute cruise on the loch or visit the village of Drumnadrochit and the Loch Ness Centre & Exhibition. The parents loved the idea of a short cruise: “It was worth the extra money”. The cruise boat at Loch Ness that takes visitors around the edge of the lake to soak in all that lush natural beauty. # Winding through the Great Glen, the tour bus took a quick stop for a view of the Ben Navis and a dekko at the Commando Memorial. The highest mountain in the British Isles, the Ben Navis is an ancient volcano and also has the ruins of an observatory that was functional from 1883 to 1904. The memorial had been built to commemorate the British Commando Forces formed during the Second World War. Drive ahead to Fort William for a tea and comfort break whilst enjoying the sight that is Loch Linnhe. # The parents were dropped off along the Royal Mile around 8.30pm. With shops staying open till 9.30pm and some keeping their doors open till 10pm, we decided to do some quick souvenir shopping. Pick up your tartan scarves and mufflers here, the Scottish shortbreads and the packaged haggis – the Scottish delicacy – to take home before heading on for dinner and sleep. Watching the play of light and shadow at 8.30pm while walking down the Royal Mile. # Finally, it’s time for Edinburgh! 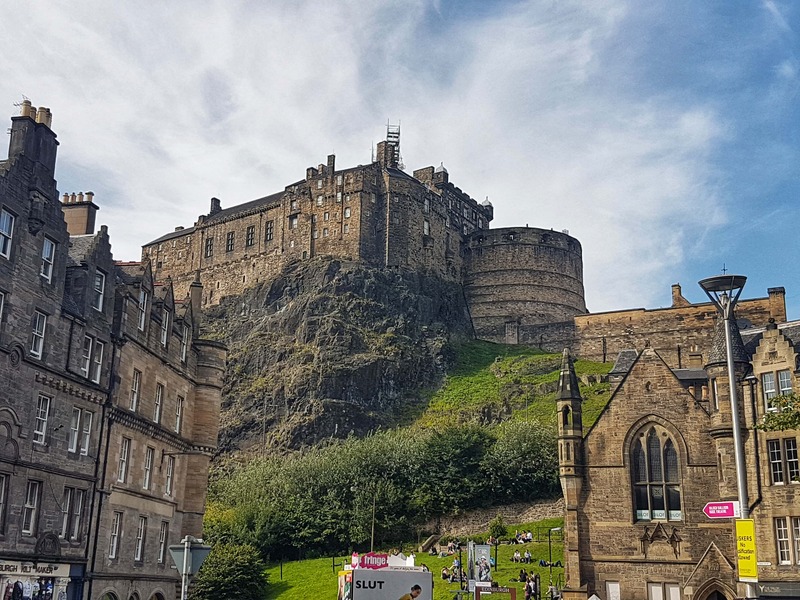 With the city being a kaleidoscope of buildings from different eras reflecting architectural brilliance, the capital city of Scotland is a visual delight. But with just half a day in hand – we were to take a flight back to Bristol at 4pm – the parents decided that the sightseeing bus was the best way to see the city. # Take a bus/tram to Waverly Bridge Station to get to the bus stop where at least three different sightseeing tour buses take off from. The routes of all three overlap but they essentially follow different circuits. Take your pick, book the tickets and repeat the drill as in Glasgow. If you’ve yet to catch up on that leg of the travel, click here. # While waiting for one of the buses to turn up, quickly snap a few photographs of the Scott Monument in the Princes Street Garden. Dedicated to Scottish author Sir Walter Scott, it is considered a prime specimen on Gothic architecture. The Edinburgh Ferris Wheel and Scott Monument form the perfect backdrop for this performer. # Once you’ve hopped into your bus, find a seat on the upper deck for a better few and photography opportunities. The route picked up by our bus was around the Church of St Andrew & St George and the Scottish National Gallery before it took a turn towards Palace of Holyroodhouse and the Scottish Parliament. Wonder if these people behind the gates were planning the Queen’s next party? # The parents’ intended to visit the Museum of Edinburgh, People’s Story and the Museum of Childhood so we got off at the Canongate Kirk stop. Take your time walking through the People’s Museum and Museum of Childhood. Two of the most interesting museums I’ve visited, the first documents the lives of the people of Edinburgh over the years, with the help of life-size mannequins and documents/products salvaged and saved. The Museum of Childhood has to be seen to be believed. With three storeys of a building dedicated to toys from across the world, this museum is the first of its kind dedicated to understanding the term ‘childhood’ and its history. Admission is free to all three museums. A toy train set, an airport hangar toy set, doll houses & dolls from the early 1900s are displayed at the Museum of Childhood. # Follow this up with a stop at the Grassmarket. The goriest of the all the stops, Grassmarket was the place for public executions between 1661 and 1668. Look past the tourists seated along Grassmarket and you will note the memorial dedicated to over 100 Covenanters who met their deaths between 1661 and 1668. Today, this patch is one of the liveliest in the city, dotted with some of the best pubs and dining spots. This should be your lunch spot. If you are spoiled for choice, then just walk into the Maggie Dickinson’s Pub for a drink and some food – the father opted for a local whiskey while I went for an elderflower-flavoured gin from the Edinburgh Gin Distillery. We recommend eating in the square if the weather permits. Round it all off with gelato at Mary’s Milk Bar. Lunch time at the Grassmarket square. Note: When driving towards Grassmarket stop, the bus will pass by the statue of the famous Greyfriars Bobby. For heavens’ sake don’t go around rubbing its nose. That’s just urban legend! Greyfriars Bobby, the famous Skye Terrier that reportedly guarded the grave of his owner for 14 years. # Hop into your bus again and enjoy the views till Lawnmarket where the parents stepped off to “at least walk up to the main gate of the Edinburgh Castle”. Stroll up to the entrance till the ticket counters. Click a few photographs at the entrance too. This was the parents’ idea of seeing Edinburgh Castle, keeping in mind the uphill paths of the castle. If you are interested in visiting the castle, don’t forget to prebook your entry tickets for discounts and hassle free entry. Edinburgh done, we rushed back to the hotel to pick up our luggage and dragged them across the street to step into the Airlink Bus to reach the airport. The departure zone of the Edinburgh Airport is always overflowing with people so it would be a good idea to reach the airport well in time and avoid the last minute rush.